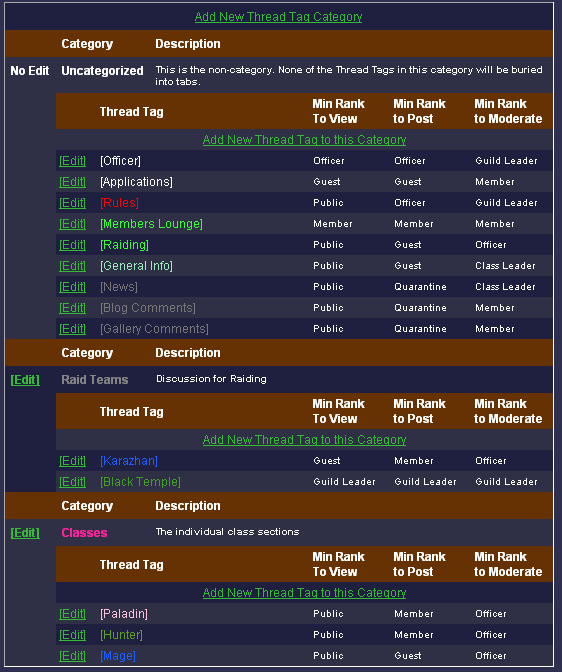 Our forum system is called "Thread Tags", and it's designed to be different. It's designed to eliminate clicks, and to reduce the number of "Forum Hops" necessary to view all the new posts. It's designed to be flexible. Admittedly, it takes a bit of getting used to. Reading through this document should help to show you how our forum system works. Once you've gotten the hang of them, and you go to an "older styled" forum, you'll wonder why forums weren't designed like this in the first place. If you wish to only see the Officer threads, click the radio button next to [Officer], and now only Officer posts will display. This function is EXACTLY like that of the standard multi-forum approach of clicking on the "Officer Forum." 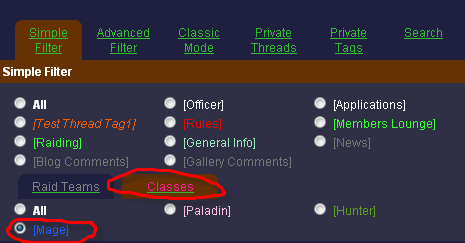 You may also choose to click on the "All" under the "Classes" option and it'll show you all the "Class-only" posts. After you've become comfortable with the idea of the Simple Filter (indeed, it doesn't take much "Training"), you can start working with the Advanced Filter. This is where the real power of the philosophy of Thread Tags becomes apparent. The "Advanced Filter" instead of operating like "Multiple Forums" (in the way that the Simple Filter does), operates as a combination of all the topics you're interested in. You choose which Thread tags (topics) you'd like to see, and you disable those Thread Tags for which you have no interest. This is done with Check Boxes instead of Radio Buttons. Check the boxes for the Tags you're interested in, and click Filter. You should notice that the only difference is now we use checkboxes instead of radio boxes (or multi-select boxes instead of single-select boxes). For example, perhaps you aren't interested in any "Off-Topic" threads. Uncheck the box, click "Filter" and now you won't see any "Off-Topic" threads anymore, but you'll still see everything else. On an even more practical level, lets say you happen to have two characters: A Paladin and a mage. You don't care about the other classes' threads. You also don't raid the Black Temple, so you don't care about Black Temple discussions. Simply click over "Classes," check the boxes for Paladin and Mage, then click "Raid Teams" and check the box for Karazhan. Immediately, you'll only see the threads you've chosen (both of these are illustrated below). 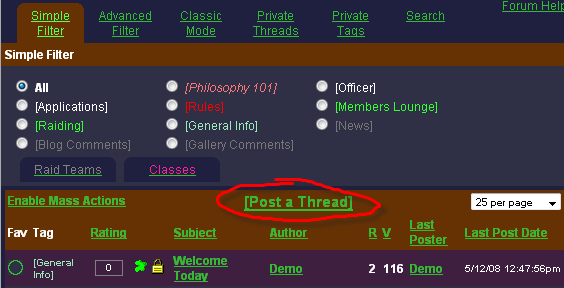 The final advanced feature of the "Thread Tags" forum system is the "Private Thread Tags" feature. Say, for example, that you happen to have a class with 3 other guildies. Say "Philosophy 201." Click "My Private Thread Tags." Create the Tag name as you see fit, change the color accordingly, and then to choose which members you wish to have in your tag, click "Select Members." The standard "Member Selector" window will pop up. Enter the login names of the members you're interested in. In this case, I have class with "Karmerr", "Starsonis", and "Durgrim." When you are ready click "OK"
Click "Submit" and your new thread tag will be created. To help ease your users into this revolutionary system, we have "Classic Mode", which formats the index just like a standard old forum style. Clicking the "Classic Mode" will will switch the forum to classic mode. If doing this doesn't automatically load the classic mode forum index, click "Classic Index" to force it to load. From there, you can click the Thread Tags as if they were a forum. For example, you could click [Rules] to see the [Rules] Threads. Our Private Thread system is significantly more powerful than the PM systems found on other sites. On our system, you can choose multiple recipients, and the post is created as a thread which is viewable ONLY to you and the recipients you choose. Compare this with standard forum systems, which allow you to create a message like an email, with a single recipient - there's no coherency. They're all detached messages. In our system, it's naturally organized to a single location with as many participants as you wish. Creating a Private Thread can be done one of three ways. The standard, and also the most powerful approach, is to do it manually, by clicking "Post a Thread" on the Forum Index. This will open the standard "Post" window. On this page, you'll want to check the box for "Private Thread"
Checking this box will enable the "Select Members" link. Click that to choose your recipients. Clicking that, will show the "Member Selector." You can type the account names manually, or you use the drop down box in the upper right corner to choose your recipients. When you're ready, click "OK" and the window will close. Fill out the rest of the "Add Post" form, and when you click "Submit", your private thread will be visible. 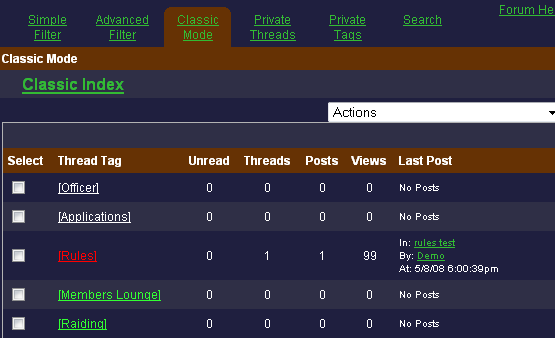 The fast and most common private thread creation method is based on other forum systems' PM system. Click the little next to the intended recipient on the forum. This will open the "Create a Thread" window, with the selected account as the default recipient. You can fill it out, and it'll be done. If you wish to add more recipients, you can always click "Select Members" like the first method demonstrated. The final method for posting private threads is just like the previous method, except it's done from the Account profile page. On an account profile page, will be a link labeled "Send a Private Thread for this User." Clicking that is exactly the same as clicking the on the forum. Another major upgrade that makes our system distinct and more power than other forum systems is the ability to attribute "Secondary Thread Tags" to threads. Cross-posting becomes very easy with secondary thread tags. This methodology allows you to assign a thread to multiple thread tags at the same time. The Primary thread tag will determine its "home" as well as determing its security. Let's say you have an officer discussion going on about the hunter performance during raids in the Black Temple. Normally, you'd just make an Officer post, and leave it at that, but for that to work, your officers need to be viewing the Officer thread tag for them to see it. Because this is relevant to hunters and to the Black Temple, it makes sense to link that thread in the the Hunter and Black Temple thread tags. When your officers view those Thread tags, the "Hunter DPS" thread will appear, with the [Officer] next to it indicating that the primary thread tag is "Officer." Additionally, this thread will ONLY show for those who are able to view the officer posts. A common practice is to make a sticky thread with basic instructions for the site (rules and conventions). Now, you no longer have to make a sticky in each Thread Tag for those users who use the Classic Mode, or for those who will filter out the Categories. 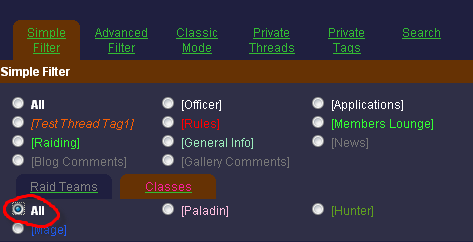 Instead, create a Thread and for Primary Thread Tag, choose "General" so that everyone sees it, and then select all the other thread tags for the Secondary Thread tags. 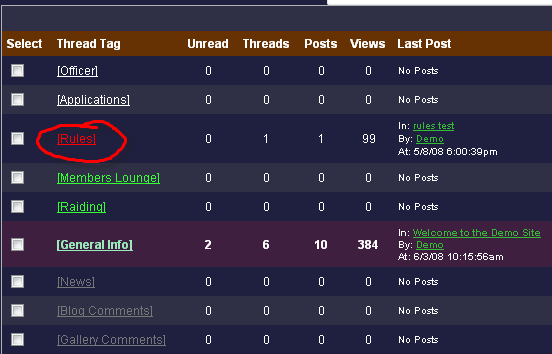 After doing this, no matter how your users are filtering the forum, that post will always appear. It's a method of making a fully global sticky. First, click on "Thread Tags (Categories)" in the Admin Menu. You can create a new Thread Tag Category (a clumping of Thread tags, like "Classic" or "Raid Teams" above), by clicking "Add new thread Tag Category"
When that's complete, you can create a new thread tag in that category by clicking "Add new thread tag to this category"
Officer - For officer-only discussion. Set this to your officer rank. We have a custom BBCode creator that you can use. The details can be found in our BBCode Guide. 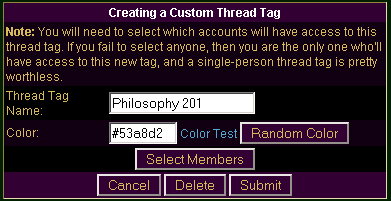 This should give you a solid understanding of the philosophy that went into designing the Thread Tags concept. Indeed, it is a fundamental restructuring of forum data, but that fundamental change is what enables these forums to be the most efficient systems available. You'll notice that some forums are already noticing the shortcomings of the "multi-forum" approach and providing attachments to their site in the form of "Recent Post Summaries" but this is merely a patch to address the symptom of a failed architecture, not curing the disease. Thread Tags is that cure.